Although not without its hits, from an overall rookie card perspective, 2004 Bowman Chrome Baseball is a weak year for the brand. However, the set also shows a brand continuing to find its footing in a hits-driven hobby. 2004 Bowman Chrome Baseball does have one rookie card that stands out as one of the best of the decade: 2010 American League Cy Young winner, Felix Hernandez. The autographed card has always been a strong seller despite the fact that the powerful hurler has yet to experience playing for a contender. 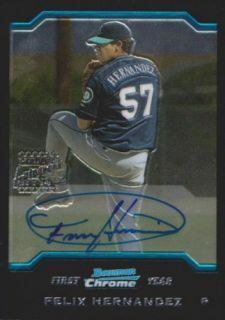 If Hernandez ever plays for a winning team and is able to post a better win-loss record, more collectors will likely take notice and send this card to the next level. Second-tier rookie cards in the set include Carlos Quentin, Conor Jackson and Yadier Molina. 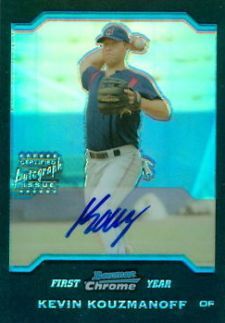 Outside of Hernandez, the best autographed rookie card belongs to Kevin Kouzmanoff. Refractors continue to play a major role in the set. Basic Refractors are inserted 1:4 packs with Autographed Refractors falling 1:100 packs. 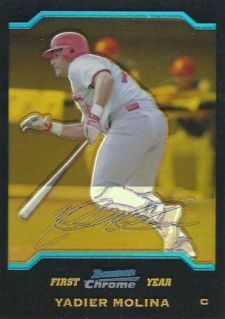 Gold Refractors are limited to 50 serial-numbered copies. X-Fractors were available exclusively as uncirculated box toppers. Each is numbered to 173 copies. 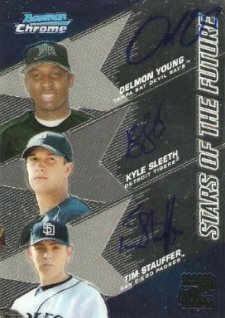 2004 saw the introduction of Blue Refractors. Serial numbered to 293 copies, the checklist was limited to 165 first-year players. Blue Refractors were initially available via a code redemption for ThePit.com. Because of the non-traditional distribution method, Blue Refractors are more difficult to track down than the print run suggests. Also new to 2004 Bowman Chrome Baseball are Stars of the Future triple autographs. Inserted 1:600 packs, of the three cards in the set, the best features signatures from Nick Markakis, Aaron Hill and Eric Duncan. 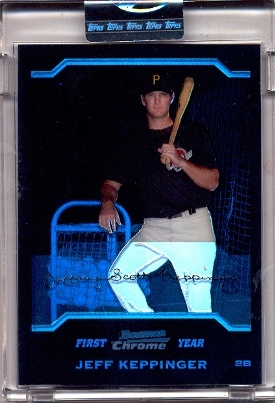 The 2004 Bowman Chrome Baseball set consists of 350 cards. Cards 331-350 represent the autographed rookie cards. Hobby boxes have 18 four-card packs. They guarantee one autographed rookie card.